Paper Stamp Scissors: Happy Mother's Day! I hope everyone had a wonderful weekend and a great mother's day! It was National Scrapbook Day on Saturday...oooh the sales and goody bags...very exciting! So, I got just a few things lol. Ok, I got quite a bit and I can't wait to play with it all! 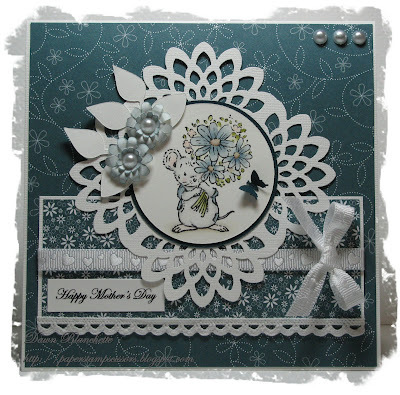 The image is from Penny Black and was coloured with Distress inks. The white doily mat was made with an EK Success edge punch (one of my new additions - love this punch!). The butterfly is a Fiskar's mini punch and the flowers are cut from my Forever Young cricut cartridge. The papers are really old Stampin' Up papers and the ribbon with the little hearts was a dollar store find that I have had for a very long time and had not yet used. The lace and pearls are from KaiserCraft and the sentiment was computer generated. Card Cupids - Flowers; I have just learned about this group and think that what they are doing is just wonderful! Pop by their blog to learn more. Thank you to everyone for stopping by! Hope you have time to leave a comment; I love reading them and it gives me a chance to check out your blog too! Wow, Dawn this is absolutely adorable. Such a sweet image and then the blue looks just stunning. Love that shape you put the image on! I'm so happy you shared your card with me at my new Word Play Weekend Challenge!